Cohesive devices come in all different shapes and sizes, including determiners, pronouns, conjunctions, adverbs and ellipsis. 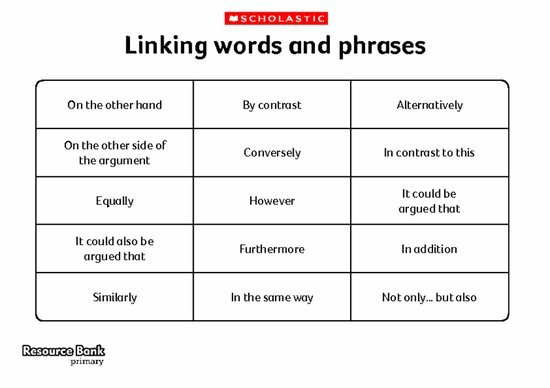 Use these linking words and phrases to help children write more cohesive texts. They can also be used when hosting debates. In groups of four, ask the children to take it in turns to suggest ideas either for or against the argument. They should try to link their point, so that it logically follows the point raised by the previous speaker. Encourage them to use the words and phrases on the cards to do this. Although using these expressions verbally can seem a little strange to begin with, it helps the children hear what a more formal ‘voice’ sounds like when writing arguments.